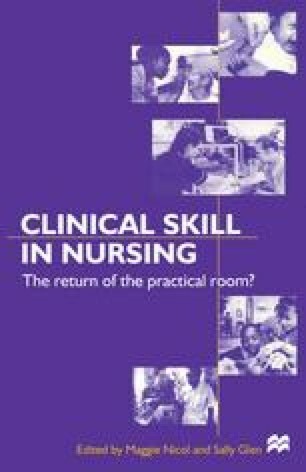 Until 1989, Registered General Nurse programmes were based on apprentice-type models, with much reliance upon experience gained in the clinical setting (traditionally the hospital) as a means of acquiring knowledge and skills. The first Diploma of Nursing in Higher Education (DipHE) (UKCC, 1986) courses in England commenced in September 1989, and the move of educational courses to Colleges of Nursing and Midwifery heralded the demise of traditional training courses centred in hospital Schools of Nursing. The merger and transfer of these Colleges into Universities in England, Scotland, Wales and Northern Ireland was completed in 1997.